Behold the Best, the Greatest Gift (Anon.) SATB, org. (2010) $2.10 First page. Commissioned for the installation of the Kegg pipe organ at Phoenixville Presbyterian Church, Pennsylvania. Original tune, text from Scottish Hymnal, early American refrain text. Excellent for larger choirs, lilting and rhythmic, perfect for Easter and Easter season. Behold, the best, the greatest gift of everlasting love! Behold, the pledge of peace below, and perfect bliss above! The Savior died and rose again triumphant from the grave, and pleads our cause at God’s right hand, omnipotent to save. And I’ll sing hallelujah, And you’ll sing hallelujah, And we’ll all sing hallelujah, When we arrive at home. Who then can e’er divide us more from Jesus and his love, or break the sacred chain that binds the earth to heaven above! Let troubles rise, and terrors frown and days of darkness fall; through him all dangers we’ll defy, and more than conquer all. And I’ll sing hallelujah, And you’ll sing hallelujah, And we’ll all sing hallelujah, When we arrive at home. Nor death, nor life, nor earth, nor hell, nor time’s destroying sway can e’er efface us from his heart or make his love decay. Each future hour that love will bless as it has blessed the past: he loved us from the first of time; he loves us to the last. And I’ll sing hallelujah, And you’ll sing hallelujah, And we’ll all sing hallelujah, When we arrive at home. 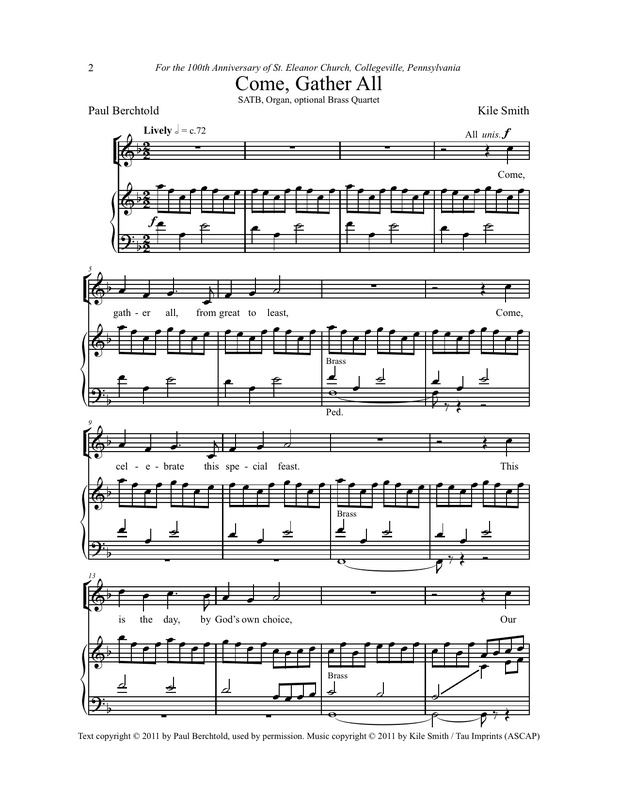 Come, Gather All (Paul Berchtold) SATB, org, opt. brass quartet (2011) $1.90 First page. Commissioned for the 100th Anniversary of St. Eleanor Parish, Collegeville, Pennsylvania, brand-new text by Paul Berchtold. Lively and moderately easy; can be done with organ and brass or just organ. 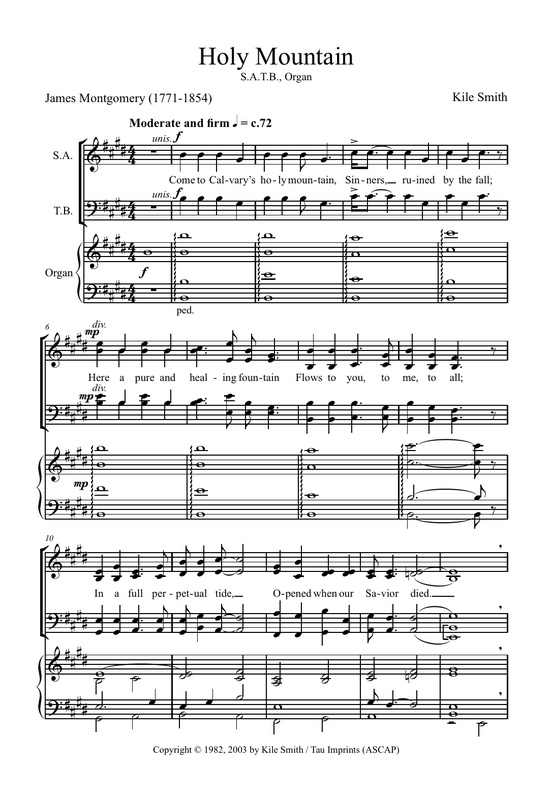 Come, Ye Sinners (Beach Spring) SATB, org (1985) $1.80 First page. The most popular anthem. Tune from The Sacred Harp. Alternating optional solos and choir lead to an easy 4-voice canon, an exciting full section, and a simple repeat of the beginning. “Compelling… attractive… straightforward, driving rhythm” —Journal of Church Music. Come, ye sinners, poor and needy, Weak and wounded, sick and sore, Jesus ready stands to save you, Full of pity, love and power. He is able, He is able, He is willing, doubt no more. Let not conscience make you linger, Nor of fitness fondly dream, All the fitness He requireth Is to feel your need of Him. This He gives you, this He gives you, ’Tis the Spirit’s rising beam. Come, ye sinners, poor and needy, Weak and wounded, sick and sore, Jesus ready stands to save you, Full of pity, love and power. 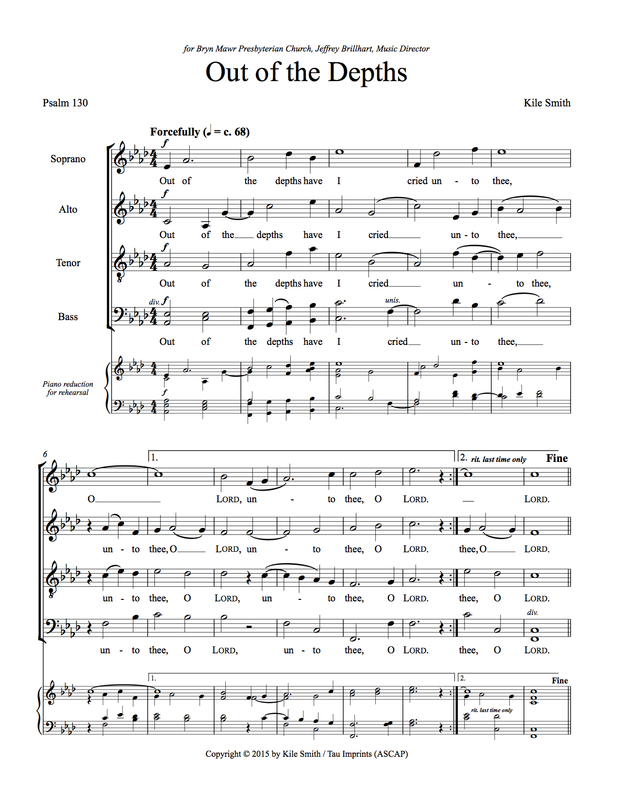 For His Mercy Endures Forever (Psalm 136) SATB (2014) Available from MusicSpoke—score and recording here! First page. Setting of the complete Psalm 136, with the refrain “For his mercy endures forever” sung 26 times, once in each verse. Commissioned by Judi and Earl Reeder, in honor of their 50th wedding anniversary, for the choir of Holy Trinity Evangelical Lutheran Church, Abington, Pa., and premiered there 26 Nov 2014, Thanksgiving Eve. O give thanks unto the Lord, for he is good: for his mercy endures forever. O give thanks unto the God of gods: for his mercy endures forever. O give thanks to the Lord of lords: for his mercy endures forever. To him who alone does great wonders: for his mercy endures forever. To him who by wisdom made the heavens: for his mercy endures forever. To him who stretched out the earth above the waters: for his mercy endures forever…. 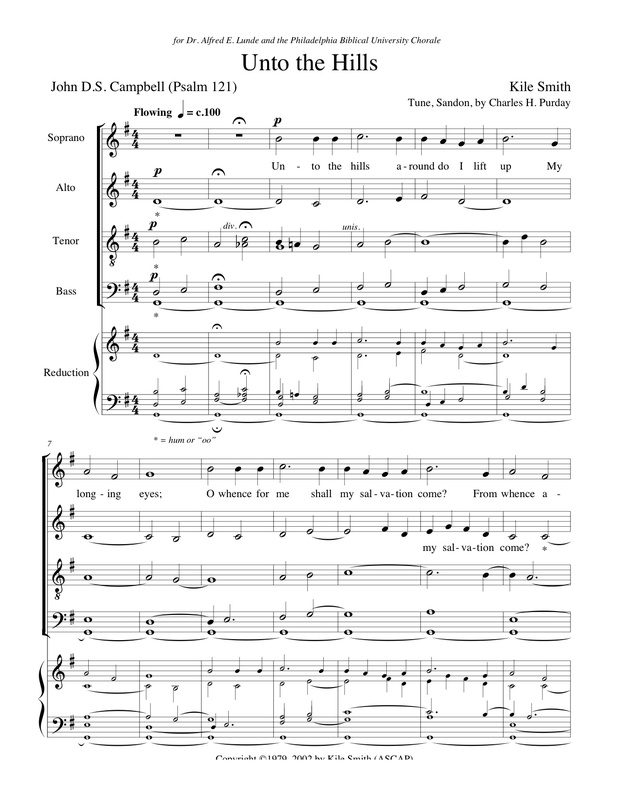 Give Ear, O Heavens (Audite caeli, Canticle based on Deuteronomy 32, the Second Song of Moses) SATB, org (2016). First page. Commissioned for the 40th Anniversary of the Ordinations of the Rev. Dr. Michael G. Tavella and the Rev. N. Amanda Grimmer, pastors of Holy Trinity Evangelical Lutheran Church, Abington, Pa. Text is the canticle Audite Caeli. Premiered 23 Oct 2016, Holy Trinity Evangelical Lutheran Church Choir, Jacqueline Smith, organist and director of music. 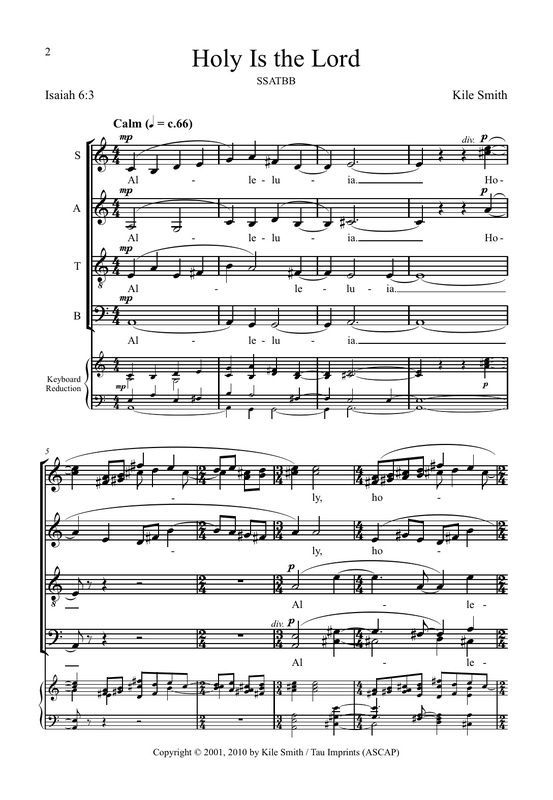 God So Loved the World (John 3:16) SATB (2008). Available from MusicSpoke—score and recording here! First page. Captivating setting of the John 3:16 text, suitable as anthem or responsory. Long lines, medium difficulty. God so loved the world that he gave his only Son, so that whoever believes in him shall not perish but have everlasting life. 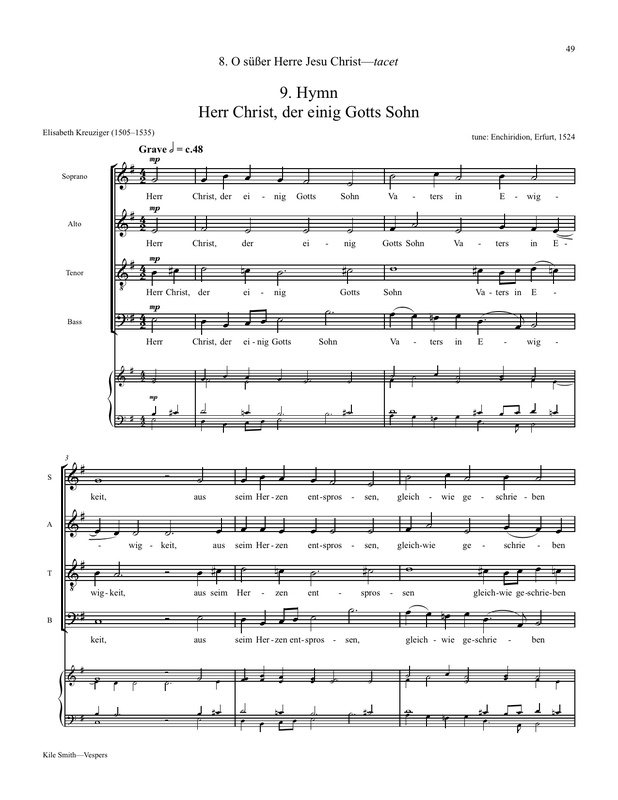 Herr Christ, der einig Gotts Sohn (from Vespers) SATB div a 16. German, English. $2.10 (2008). First page. The ninth movement of Vespers, an a cappella tour de force for larger choirs. Starts in four voices, then divides into eight, then 16, back to four. With an original English translation by the composer added to the German text. God’s only Son, from all time heart of the Father, came. Yes, Christ our Lord forever stands on the Word, the same. He is the Star of Morning, blazing with bright adorning far past all other stars. For unto us, in end time a little child is born that, in the sight of sublime God, we are not forlorn. Now Death for us is broken, Heaven is thrown wide open, life is brought back again. Your love and truth, increasing, grow in us every hour. We, in the faith unceasing, serve in the Spirit’s power. That we may taste your sweetness, ﬁll up our hearts’ completeness so that we thirst for you. Come, ravish us and quicken, rouse us with gifts of grace. May our old Adam sicken, new life to take his place. Then here, our dear contrivings—all earthly thoughts and strivings—shall ever rise to you. Holy Is the Lord (Isaiah 6:3) SSATBB (2001/10) $1.30. First page. 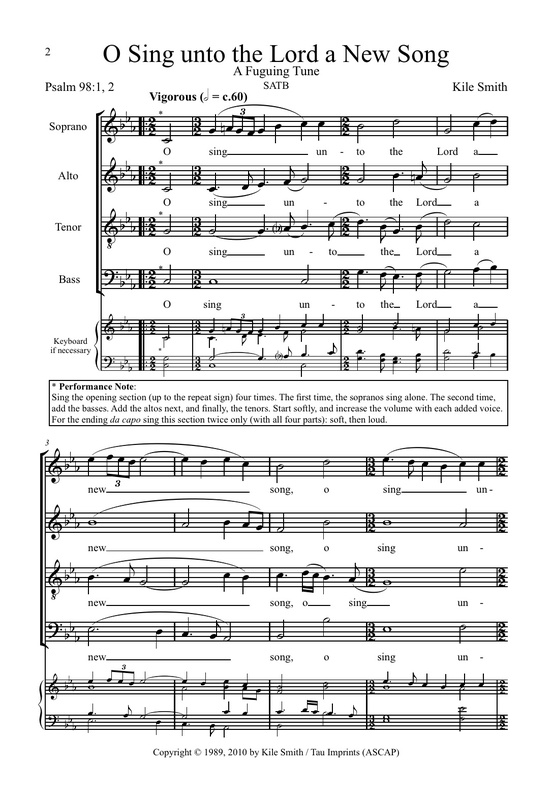 An a cappella Holy Trinity setting, suitable as anthem or responsory. Haunting and moderately difficult for larger choirs. Alleluia. Holy, holy, holy is the Lord of hosts; the whole earth is full of his glory. Alleluia. 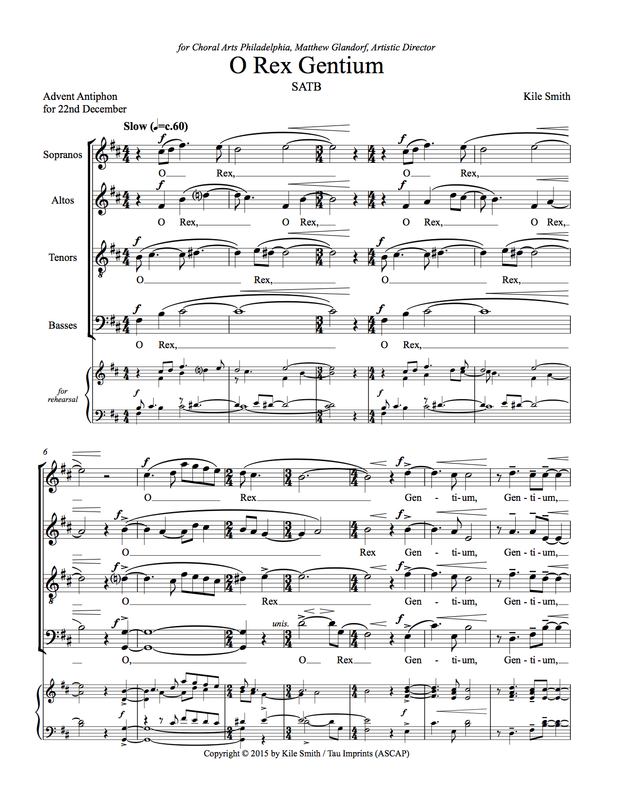 Holy Mountain (James Montgomery) SATB, organ (1982/2003). Available from MusicSpoke—score and recording here! First page. Original tune with an early American sound that recalls shape-note singing with spare harmonies. Popular. Come to Calvary’s holy mountain, Sinners, ruined by the fall; Here a pure and healing fountain Flows to you, to me, to all; In a full perpetual tide, Opened when our Savior died. Come in sorrow and contrition, Wounded, impotent and blind; Here the guilty free remission, Here the troubled, peace may find: Health this fountain will restore; He that drinks shall thirst no more. He that drinks shall live forever; ’Tis a soul-renewing flood; God is faithful; God will never Break his covenant of blood, Signed when our Redeemer died, Sealed when he was glorified. Come to Calvary’s holy mountain, Sinners, ruined by the fall; Here a pure and healing fountain Flows to you, to me, to all. 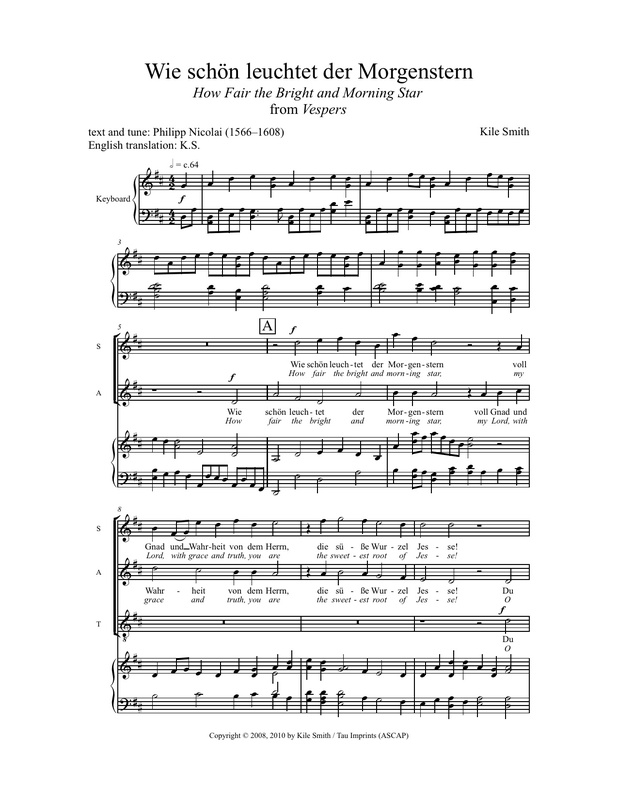 How Fair the Bright and Morning Star (from Vespers, Wie schön leuchtet) SATB, kbd. German, English. $2.30 (2008/10). First page. 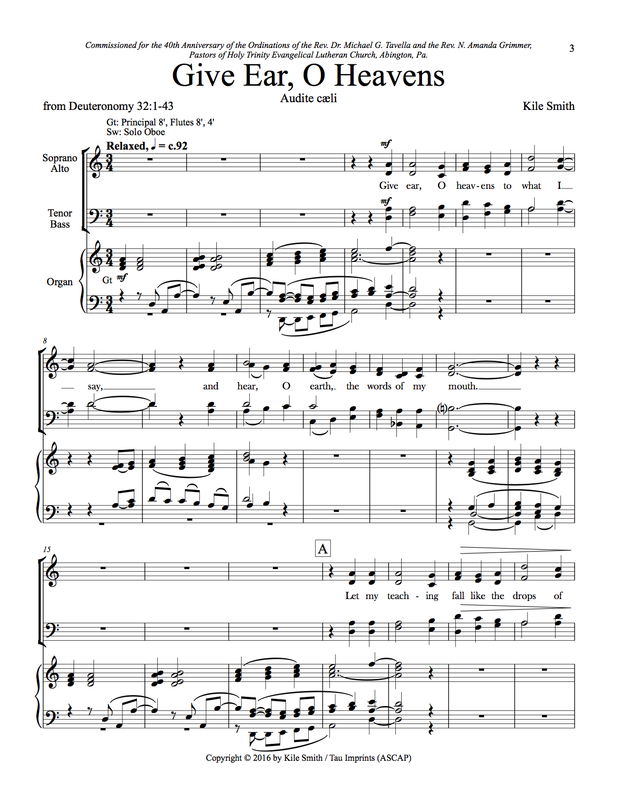 The second movement of Vespers, with an original English translation by the composer added to the German text. Text and translation. also SATB, string sextet, harpsichord. 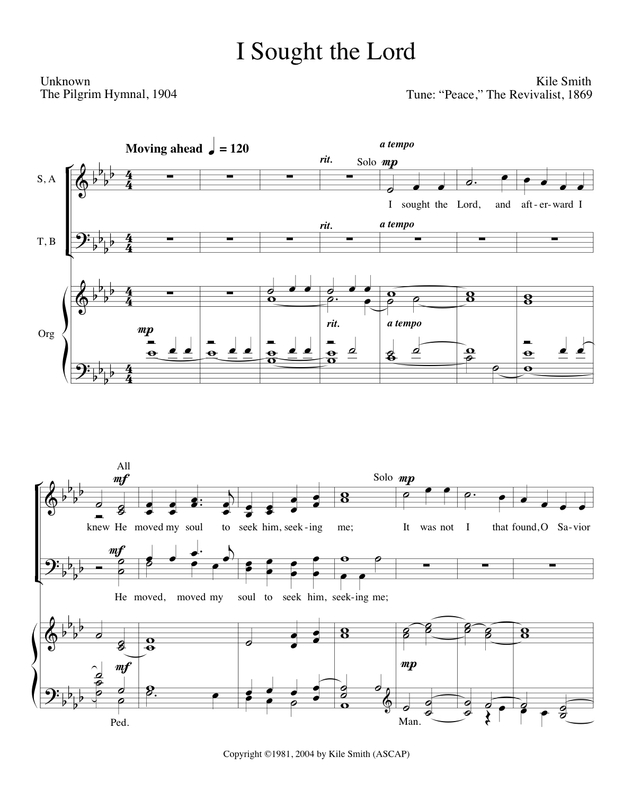 Full score (21pp), two violins, two violas, cello, double bass, keyboard/choral score (with page turns), $20.00. The choir may sing from the octavos above. Arranged for the Aestas Consort, Chicago. I Sought the Lord, and Afterward I Knew (Pilgrim Hymnal) Opt. 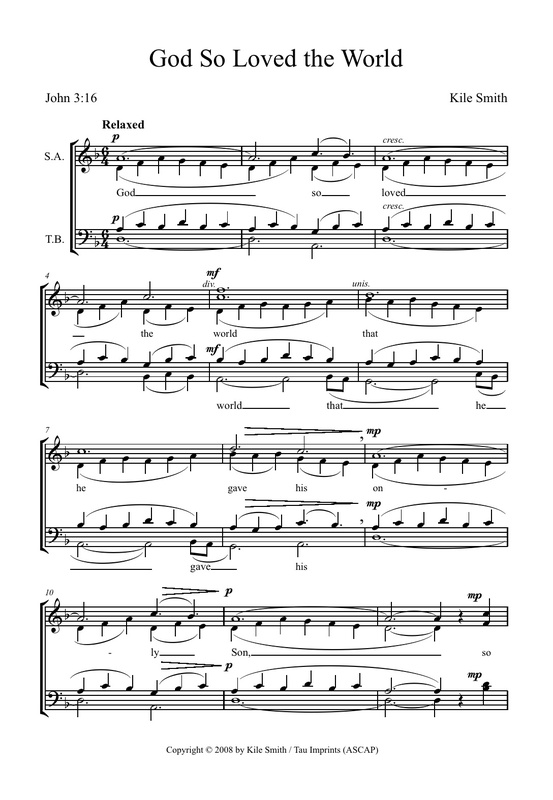 soprano solo, SATB (1981/2004). $1.80 First page. The tune is Peace, from The Revivalist, 1869. The text is from The Pilgrim Hymnal, 1904. A very straightforward beginning with optional solo opens up into a confident 4-part proclamation of faith. I sought the Lord, and afterward I knew He moved my soul to seek him, seeking me; It was not I that found, O Savior true; No, I was found of thee. Thou didst reach forth thy hand and mine enfold; I walked and sank not on the storm-vexed sea; ’Twas not so much that I on thee took hold As thou, dear Lord, on me. I find, I walk, I love, but O the whole Of love is but my answer, Lord, to thee! For thou wert long beforehand with my soul; Always thou lovedst me. Jesus, Thou Joy of Loving Hearts (Anon.) SATB, org (1985/2010). $2.10 First page. SATB, organ. Original music for the well-known hymn text, first composed as a wedding piece for solo voice and organ. Warm harmonies with a colorful, chant-like melody. Easy to medium. Jesus, thou Joy of loving hearts, Thou Fount of life, Thou Light of men, From the best bliss that earth imparts We turn unfilled to thee again. Our restless spirits yearn for thee, Where’er our changeful lot is cast; Glad, when thy gracious smile we see, Blest, when our faith can hold thee fast. O Jesus, ever with us stay; Make all our moments calm and bright; Chase the dark night of sin away, Shed o’er the world thy holy light. My Shepherd Will Supply My Need (Southern Harmony) SATB, org (1980/2003). $1.80 First page. Very popular. The beautiful 1855 Southern Harmony tune Resignation, in a warm, simple setting. 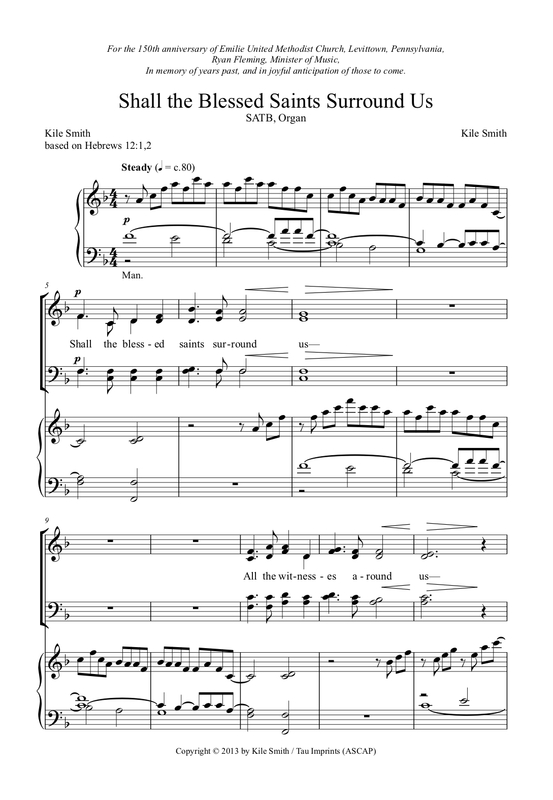 Also one of the three arrangements for violin and piano in American Spirituals, Book One. My shepherd will supply my need; Jehovah is his name: In pastures fresh he makes me feed Beside the living stream. He brings my wandering spirit back When I forsake his ways; And leads me, for his mercy’s sake, In paths of truth and grace. When I walk through the shades of death Thy presence is my stay; One word of thy supporting breath Drives all my fears away. Thy hand in sight of all my foes, Doth still my table spread; My cup with blessings overflows, Thine oil anoints my head. The sure provision of my God Attend me all my days; O may thy house be my abode. And all my work be praise. Then will I find a settled rest, No nevermore to roam; No, not a stranger, nor a guest, But like a child at home. O Come, O Come, Emmanuel (Veni, Emmanuel) SATB, org, opt. brass quintet (1981/2013). Available from Concordia Publishing House—score and recording here! Also a version with brass quintet instead of organ. Simple setting of the well-known tune, mostly unison and 2-part, but with an explosive final 4-part “Rejoice, rejoice!” Moderately easy. 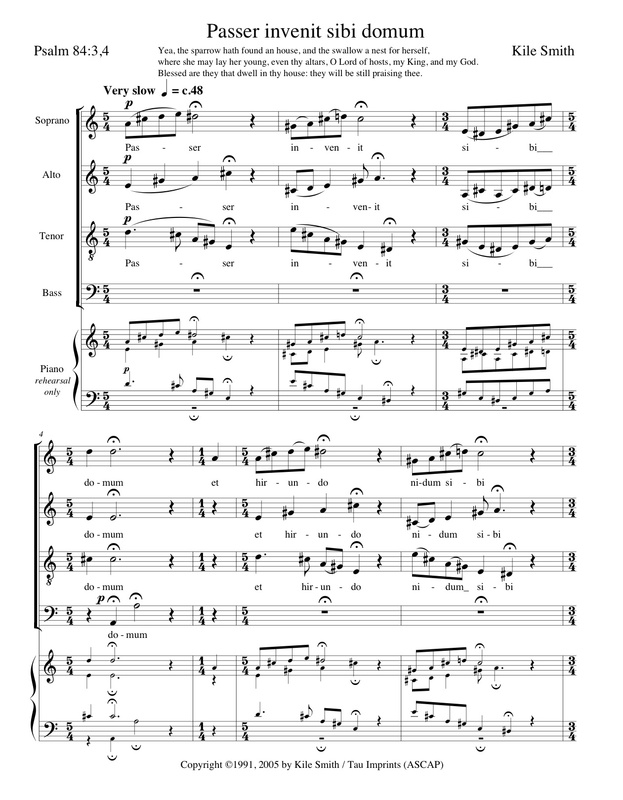 O Rex gentium (O Antiphon) SATB (2015). First page. SATB. 6′. Commissioned by Choral Arts Philadelphia, Matthew Glandorf, artistic director, and premiered 2 Dec 2015, at St. Clement’s Church in Philadelphia as part of their O Antiphons project. O Sing unto the Lord a New Song (Psalm 98:1) SATB Fuguing tune, $2.00 (1989/2010). First page. Original tune, moderate difficulty. O sing unto the Lord a new song, for he has done wonderful things, his right hand and his holy arm have gained for him the victory. The Lord has made known his salvation, his righteousness has been revealed in the sight of the nations. 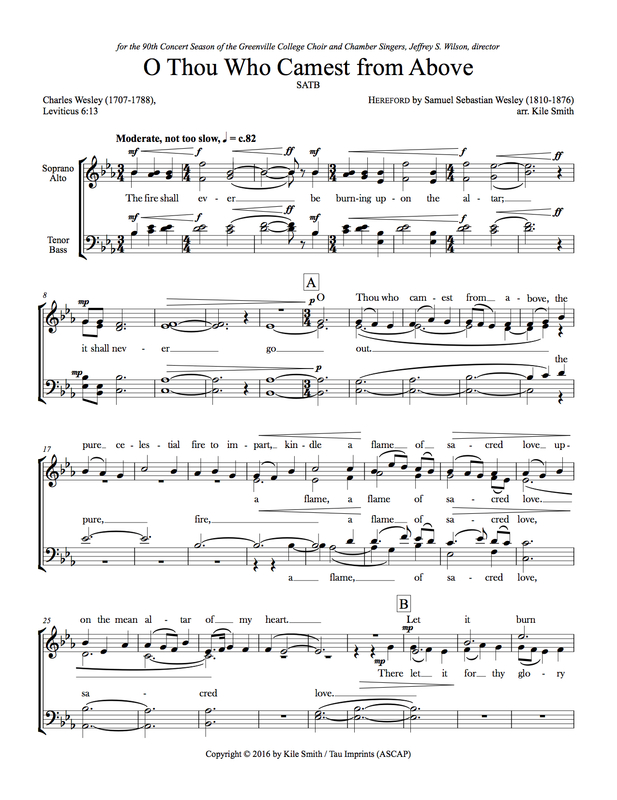 O Thou, Who Camest from Above (Leviticus 6:13, Charles Wesley) SATB 4‘ (2016). First page. Commissioned for the 90th Concert Season of the Greenville College Choir and Chamber Singers, Jeffrey S. Wilson, director. The tune is Hereford by Samuel Sebastian Wesley (1810-1876), the text is (1707-1788), is based on the Leviticus verse. And make the sacrifice complete. Amen. 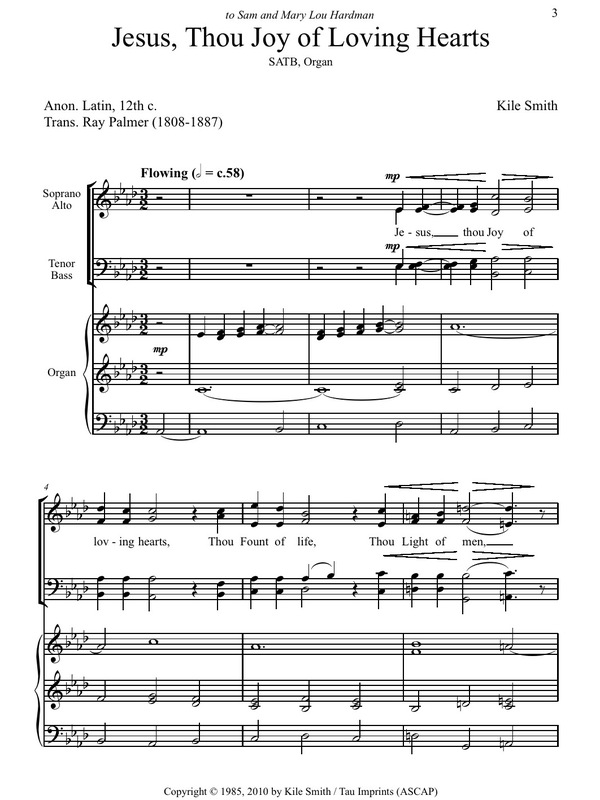 Out of the Depths (Psalm 130) SATB 6′(2016). First page. Commissioned by Bryn Mawr Presbyterian Church, Jeffrey Brillhart, music director, premiered 13 Mar 2016. 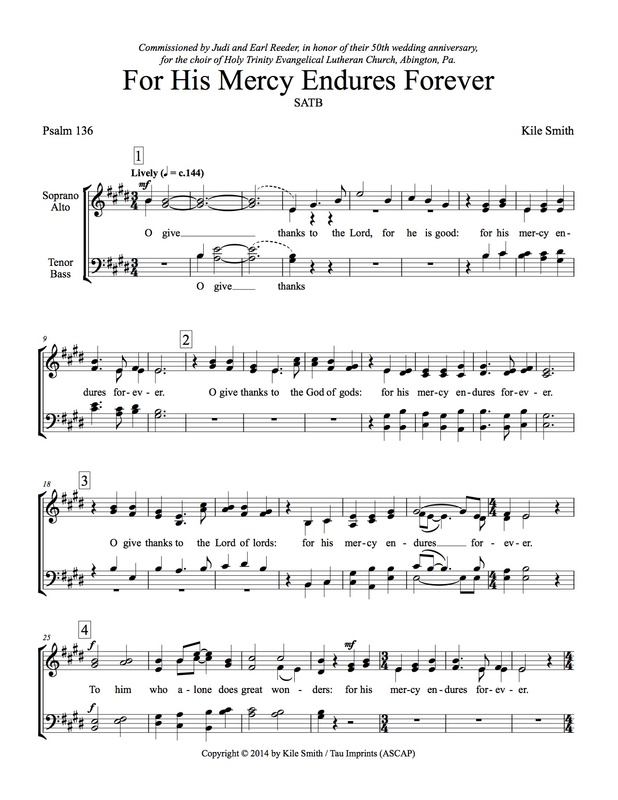 Passer invenit (Psalm 84:3,4) SATB $1.60. (1991/2005) First page. Challenging a cappella setting of Psalm 84:3,4 in Latin. Yea, the sparrow hath found her an house, and the swallow a nest for herself, where she may lay her young, even thy altars, O Lord of Hosts, my King, and my God. Blessed are they that dwell in thy house: they will still be praising thee. 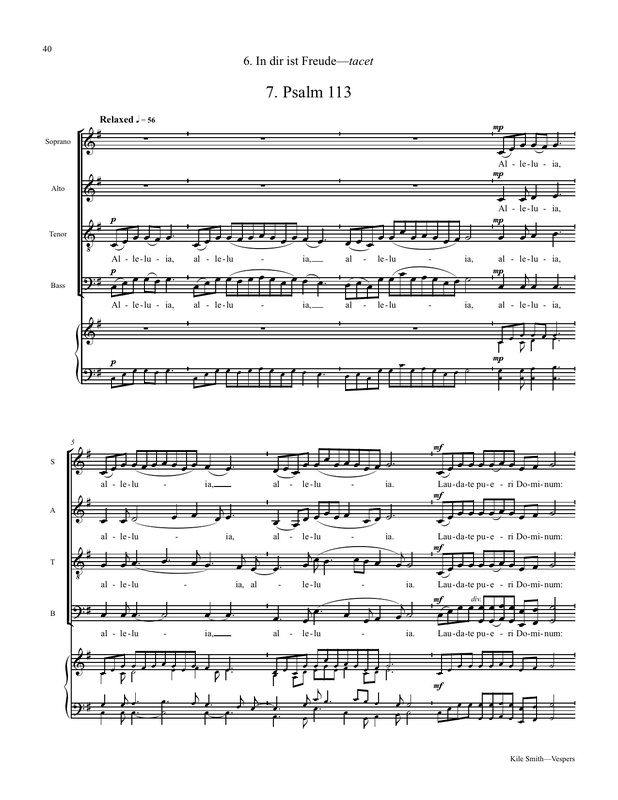 Psalm 113 (from Vespers) SATB, kbd (2008) $2.10. First page. The seventh movement of Vespers, with keyboard reduction. Praise ye the LORD. Praise, O ye servants of the LORD, praise the name of the LORD. Blessed be the name of the LORD from this time forth and for evermore. From the rising of the sun unto the going down of the same the LORD’s name is to be praised. The LORD is high above all nations, and his glory above the heavens. Who is like unto the LORD our God, who dwelleth on high, Who humbleth himself to behold the things that are in heaven, and in the earth! He raiseth up the poor out of the dust, and lifteth the needy out of the dunghill; That he may set him with princes, even with the princes of his people. He maketh the barren woman to keep house, and to be a joyful mother of children. Praise ye the LORD. 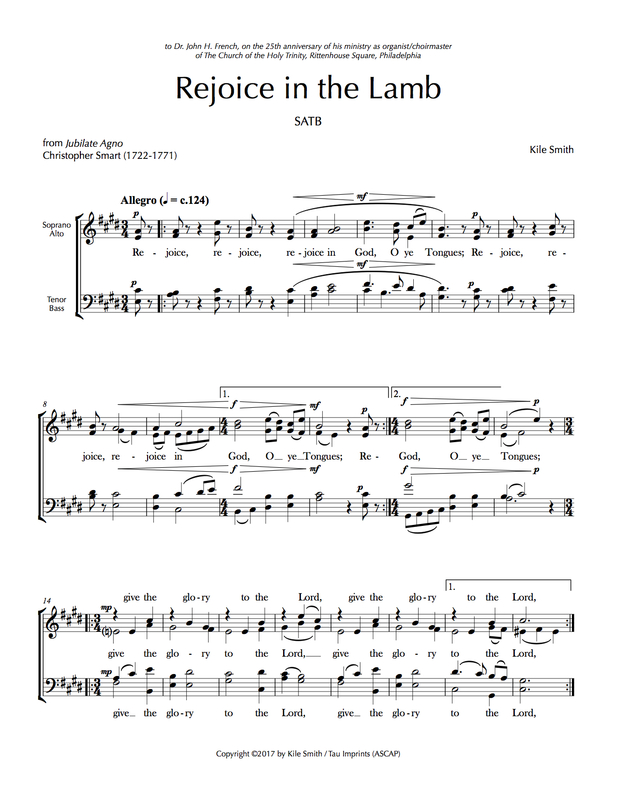 Rejoice in the Lamb (Christopher Smart) SATB 5′ (2017). First page. To Dr. John H. French, on the 25th anniversary of his ministry as organist/choirmaster of The Church of the Holy Trinity, Rittenhouse Square, Philadelphia. Premiered 2 July 2017. 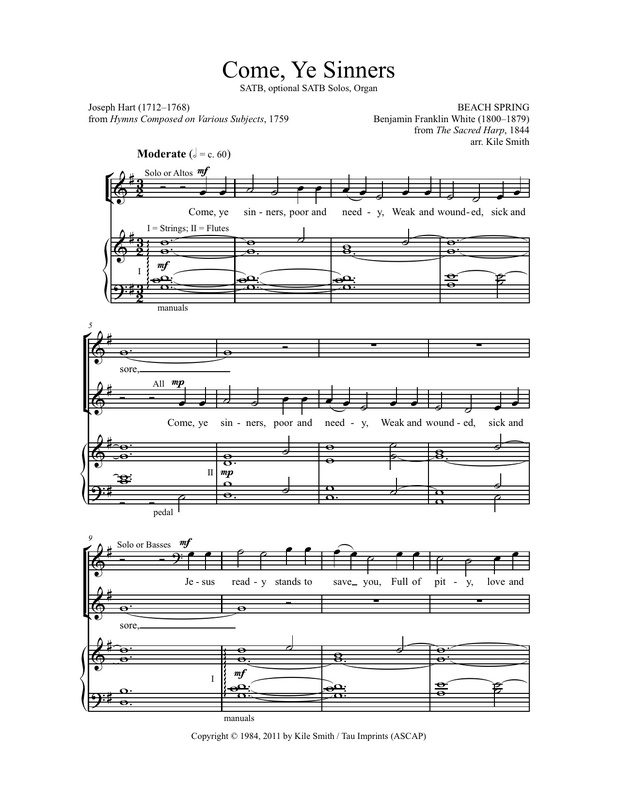 Shall the Blessed Saints Surround Us (text by Kile Smith, after Hebrews 12:12) SATB, pno or org (2014). First page. Commissioned for the 150th Anniversary of Emilie United Methodist Church, Levittown, Pa., Ryan Fleming, Music Director., premiered 18 May 2014. And not guide us on our way? Guide to Jesus every day. 2. Yet the chains of sin are grievous. As we journey on our way? Freed by Jesus every day. Up to Calvary that day. Joyfully He showed the way. Blessings speed us on our way. 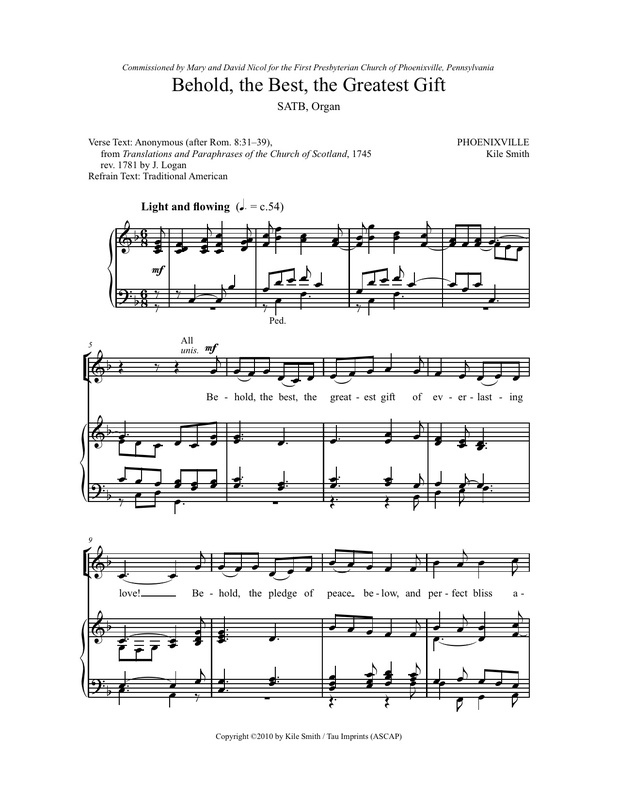 Unto the Hills (John D. S. Campbell, after Psalm 121) SATB div. $1.90 (1979/2002). First page. Appropriate for larger groups, this was composed for a college choir. Setting of the well-known “Sandon” tune; the text is based on Psalm 121. Unto the hills around do I lift up My longing eyes; O whence for me shall my salvation come? From whence arise? From God the Lord doth come my certain aid; From God the Lord, who heav’n and earth hath made. He will not suffer that thy foot be moved; Safe shalt thou be. No careless slumber shall His eyelids close, Who keepeth thee. Behold, He sleepeth not, He slumb’reth ne’er, Who keepeth Israel in His holy care. Jehovah is Himself thy keeper true; Thy changeless shade; Jehovah thy defence on thy right hand hath made. And thee no sun by day Shall ever smite; No moon shall harm thee in the silent night. From ev’ry evil He shall keep thy soul, From ev’ry sin; Jehovah shall preserve thy going out, Thy coming in. Above thee watching, He whom we adore Shall keep thee henceforth, yea, forevermore. 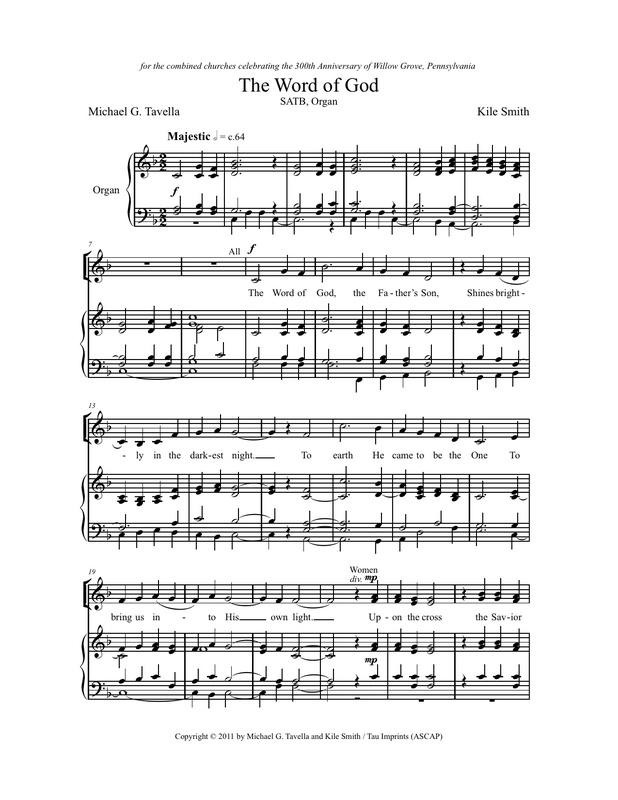 The Word of God (Michael G. Tavella) SATB, org (2006/11). First page. 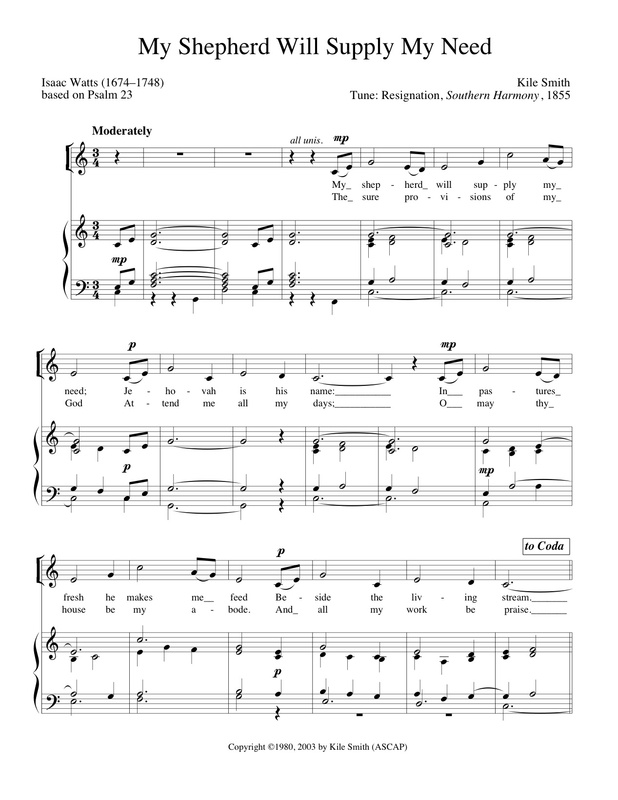 A hymn composed for Holy Trinity Lutheran, Abington, Pa. Anthem composed for the combined churches celebrating the 300th Anniversary of Willow Grove, Pa., in 2011.